My name is Takuma and I’m from Japan. I began in the food and beverage industry when I was 18 years old as a barista, then I moved into bartending two years later. I started in a bar called Code Name Mixology, where I learnt all the basics of bartending by my manager Shinzo Nagumo. 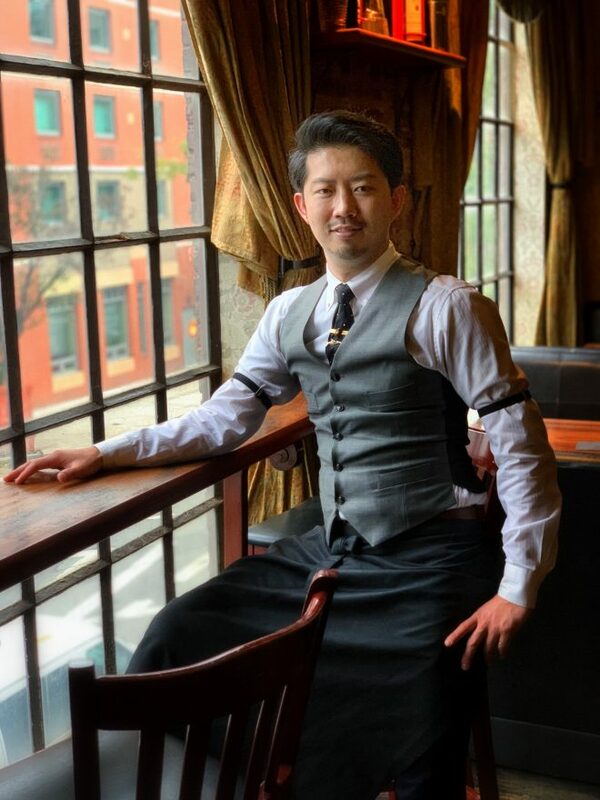 I attended many bartender competitions and the biggest one was world class competition in Japan 2011, where I made a lot of friends from around the world. At the time my weakness in presenting my cocktail was my English, but it made me want to improve my language skills and discover the world. Then I met Shingo Gokan, the former manager at Angel’s Share who owns SG club in Tokyo and SpeakLow in Shanghai. I told him how I felt and he told me to buy a ticket and move to NYC. Ever since then, I’ve been working at Angel’s Share and now after six years, I’m the manager here. I was inspired by two mentors, Shuzo Nagumo and Shingo Gokan, and even if they are very different, I’ve learnt many things from both of them. I love jazz piano, so in my dream bar, I would like to have live piano music. Just like here in Angel’s Share, I would love big windows so I can see the seasons changing through them. It would be a cosy place for around 40 people, sitting only, so you can have a bespoke service. I’d also offer fusion food with the drinks. I love watching movies in the theatre. I also try to go to new bars and restaurants which people have recommended to me. Recently I learnt many hints from chefs and pastry chefs. And the cocktail I am going to make for you, called Peel me a Grape, is inspired by a meal I had in Atera, a Michelin star restaurant in Tribeca, and is actually a twist on a wet martini. I love all the spirits, but If I need to choose one, it would be scotch whisky. I have been drinking that since I was 20 years old. One of my favourite cocktails is made with scotch whisky and is from our former menu, it’s called Islay Sour. It combines Bowmore 12 years with lemon, sugar, egg white, and smoked salt on the rim then it’s sprayed with Bowmore 25 years. In a whisky cocktail, it’s important for me to taste the whisky on the top. Of course, it’s about balance and dilution with air or no air, and technique. When I say technique, let me tell you a story. For three years I made a martini for one of my mentors. Each time he wasn’t happy, something was wrong with the dilution or there was something else not quite right. One day after three years he said yes, that’s a good martini, that’s how a martini should be made. But basically, for everyone, it’s about individual taste. For me, I love sweet cocktails with a dry side. But in the end, the most important thing is where and who you have the drink with. Like I want to see the seasons through my window, I want to use seasonal products in my cocktail. You have to go to my mentor’s bars in Tokyo, Code Name Mixology and SG Club. Ben Fiddich is a great too and Ku Bar in Bangkok. Then here in New York City check out the Office, Mace, Black Tail, 18th room, Dead Rabbit and Dante.